The topic of GRATITUDE seems to be everywhere this month. Why is it important? How do we incorporate it into our kids’ lives? Why is a Pediatric Dentist office in Golden Valley talking about gratitude? Robert A. Emmins, Ph.D. is a professor of psychology and a gratitude expert at UC Davis who has spent years researching how gratitude practices impact overall mental and physical health. He has found that people who are grateful have higher self-esteem, are more resilient, less retaliatory, and are happier overall. Attitude of Gratitude– Set up a gratitude station at your house for the holiday season. Create the opportunity for people to share with their family members what makes them feel grateful about them. For ours, we put a piece of Kraft Paper on the wall and then taped a lunch bag for each family member onto it. We put some index cards and pencils on the table below and voila! A place to reflect on gratitude and share those feelings with the ones we love most. 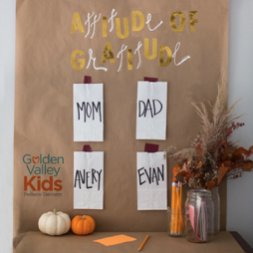 It could also be as simple as putting a notebook in a common area for everyone to share what they’re grateful for. Gratitude scavenger hunt– Explore kid friendly areas of Minneapolis in teams of two and make sure each team has a camera or camera phone. Give everyone a list of photos to hunt for related to things that make them feel grateful. Examples: Find something that makes you happy. Find something that makes someone in your family smile. Find something that you love to smell. Find something that is your favorite color. Find something you are thankful for in nature. Find something that you can turn into a gift for someone else. After your hunt, have everyone share the treasures they captured. Family Research Project– Take advantage of family get-togethers and turn your kids into investigative journalists! Have them ask family members about what they’re grateful for and record their answers using your phone. Flip it Around– Take a recent negative experience (a bad grade, a lost game, behavior that could put you on Santa’s Naughty List) and create a positive narrative around it by focusing on lessons learned. Example: On our last visit to Golden Valley Kids Pediatric Dentistry, Golden Valley’s best dentist for kids, we had a cavity that needed to be filled. We learned that getting a filling isn’t as scary as we thought, and that we need to spend more time brushing and flossing. The holidays are a wonderful time to give gifts, but we also want our kids to appreciate the most important things: family, good health, fun times together. It’s so important to teach them that the best way to have what you want is to want what you have! As you can tell, we want the kids of Minneapolis to be healthy physically and mentally. Practicing gratitude leads to lots of smiles.